There are no plans to add new features to any of my plugins. They will be kept up to date and working, however I do not have plans to extend their functionality. built template, it simply does nothing. (I have checked my config, everything seems right) - and I can still create and link the standard nethergate.gate style portal. Is there a limit on how large gates can be? Or something I am missing. Any feedback would be great! Thanks in advance. The only limit to gates would be caused by memory usage during load, but I've had gates far larger without issues. Its been a while since ive played Minecraft..
Sarus wrote: Its been a while since ive played Minecraft..
Development isn't very active, but I haven't had any reports of it not working with 1.5.2. First posts require validation so as to deter spambots. The problem is that I was building the gate in creative, and had been using Stone Brick Monster Eggs, rather then stone brick. took me a few hours to figure this one out ... Sorry about that. Without more information I am unable to act on this. Hmm; now that I think about it... I don't really want this to be possible haha. (Super change of mind after updating to 1.6.1 - would def need a config option if implemented) - Don't listen to me I'm just rambling. Are they not considered vehicles? If not, that's kinda dumb on Minecraft's part. Owell, I'll look into it. Well, horse movement is considered a PlayerMoveEvent, that combined with the current lack of a horse API makes it impossible to add any horse support. If the Bukkit team does things right and makes horses trigger a VehicleMoveEvent, then they should be handled by the same code as the minecarts. same errors again, seems to happen on multiworld teleportation. they still get to their destination, but many times are stuck in the block under the stargate. regardless of pattern/design. using 1.5.2 R1.0 and running permissions bukkit. what other info do you need from me for this error? Last edited by Malaeus on July 6th, 2013, 4:51 pm, edited 1 time in total. Malaeus wrote: using 1.5.2 R1.0 and running permissions bukkit. The part I need would probably be above that, containing where in Stargate it is crashing, not the Stacktrace through the Bukkit code. ill pull the log and see if it has more info. sorry i wasnt quite sure what you needed. thanks for the help. Hi. We've been using this plugin for a long time and it is essential to how our server works, so we're really grateful of its existence. Thanks! I just registered to say that there are some problems with entities since 1.4's new method of dealing with portals and entities for example, I noticed, particularly with occasions where entities are riding each other, that things won't teleport, or that things will get a bit glitchy. I tested this out when portals teleport from one world to another and when they teleport to a destination inside the same world. 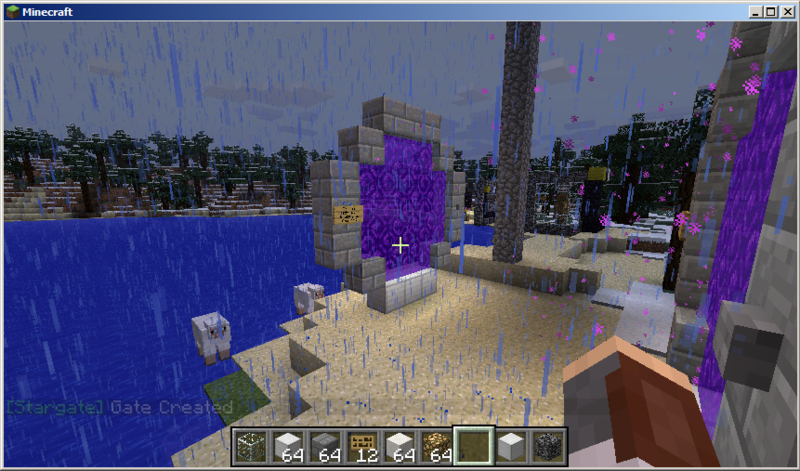 In testing, I used portals that were close by, so from that we tell that it's not connected to chunks not being loaded.